If the Government introduced the greener petrol E10, it would deliver annual emissions savings equivalent to taking 700,000 cars off the road. You probably don’t realise that petrol in the UK already contains up to 5% of a greener renewable fuel called bioethanol. This makes the petrol more environmentally friendly. You’re probably thinking 5% isn’t a lot? Why not more? Good question! 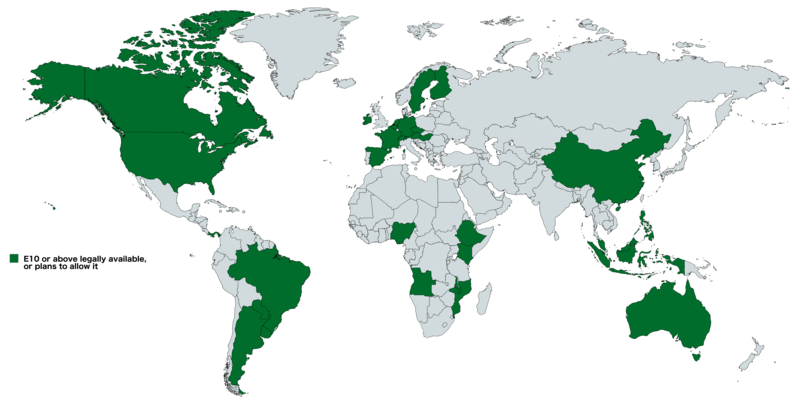 Many other countries throughout the world have 10% bioethanol in their petrol known as E10, or have plans to introduce it soon (See map below). But the UK Government has so far refused to introduce it in the UK. If it did, it would be the emissions savings equivalent of taking 700,000 cars off the road every year. It wouldn’t change anything for you – just pick up the petrol pump and fill up your car as normal. The Bioethanol going into your car is also mostly produced by British farmers here in the UK, so taking this step would also support British jobs while also improving our energy self sufficiency. Another win-win. Get behind the campaign to allow E10 to go on sale in the UK by sending a letter and/or tweet to your local MP – we’ve already written you a draft, so all you need to do is click on the buttons below! Sweden, Germany and France already have hundreds of pumps where fuel is available with a blend of up to 85%, let alone 10%. Even the US, often cited as the world's least green/petrol mad nations allows pumps to sell bioethanol blends of 10%. The UK is one of the greenest countries in the world, leading the world in the adoption of new technologies to cut down our carbon footprint. Correct? Not quite. While the UK currently allows a greener type of fuel to be available at the pump called E5, fuel sold in the UK currently can't have a greater blend of 5% bioethanol unlike many other nations. Sweden, Germany and France already have hundreds of pumps where fuel is available with a blend of up to 85%, let alone 10%. In USA, famed for its love of cars, E10 has been available for decades and is over 95% of gasoline sales. Many other nations, including China have also set targets to make a 10% blend available for the first time or more widely available within the near future. So, the UK is lagging way behind the rest of the world by only allow E5 (5% blend to be sold at its pumps). It's time the government not only allowed a 10% blend (or higher) at the pump, but actively supported and championed its availability and adoption by drivers across the country. This would put the UK literally and figuratively back in the driving seat. The UK has a massive air quality problem which E10 could help address. The World Health Organisation estimates that 30 areas in the UK have fine-particle air pollution levels above 10 micrograms per cubic metre, with another 17 at that limit. Fine-particle air pollution is particularly bad for us, penetrating deep into the lungs and cardiovascular system, causing diseases including stroke, heart disease, lung cancer and respiratory infections. A recent study used by the EU Commission to evaluate the air quality impacts of biofuels showed NOx to be reduced by 34% and non-methane hydrocarbons by 60% when moving from E5 to E10, with E85 offering even further improvements. A study from the University of Melbourne showed that E10 resulted in 18% less NOx, 15% lower hydrocarbons and 26% lower particulates than standard unleaded petrol. A study in Sao Paulo, which has 7m vehicles and the world’s largest gasoline/ethanol flexible-fuel fleet, showed that when motorists used higher levels of ethanol due to lower prices, emissions of dangerous lung-damaging particulates decreased. When ethanol prices increased and drivers used higher levels of gasoline instead, the concentration of nanoparticles increased by 30%. This is the only study to have been done in non-laboratory conditions and shows a clear correlation of ethanol lowering particulates. The recent study used by the EU Commission to evaluate the air quality impacts of biofuels illustrated particulate matter to be reduced by around 7% when moving from E5 to E10. Benzene and Butadiene emissions, both of which are highly carcinogenic, decrease by around 25% with higher levels of ethanol blending in fuel. The use of E10 is widely documented as achieving at least a 25% reduction in carbon monoxide emissions. Ethanol is not carcinogenic, whilst several chemicals contained within petrol are, so bioethanol blending helps to reduce the carcinogens within the fuel. The oxygen contained within ethanol helps the fuel to burn better and increases the efficiency of the engine, lowering the hydrocarbons that are released. Decreasing the amount of petrol burnt every on UK roads would help reduce the UK overall carbon footprint. Latest figures by the Independent Committee on Climate Change, states that Transport continues to be the largest-emitting sector in the UK and that its going up, accounting for 28% of total Green House Gas emissions in 2018 compared with 27% in 2016. Using ethanol as a vehicle fuel has measurable greenhouse gas (GHG) emissions benefits when considering the life cycle steps required for gasoline. Carbon dioxide (CO2) released when ethanol is used in vehicles is offset by the CO2 captured when crops used to make the ethanol are grown. As a result, FFVs running on high-level blends of ethanol produce less net CO2 than conventional vehicles per mile traveled. While moving from E5 to E10 would only see a small improvement, it is still worth doing as a step in the right direction, and one more action every citizen should have the right to take to help combat the UK's carbon problem.